Watch YouTube video now! "How to Enhance your ESL skills with Private Tutoring!" Email me at carolyncf2017@gmail.com for more information and to get your package sent to you! Enhance your skills with 1-on-1 ESL tutoring sessions during your off hours and help learners build on skills and prepare for career and educational testing. Learn about setting fees, the initial assessment, finding and keeping students, developing lesson plans, billing and record keeping and shifting from classroom teaching to 1-on-1 teaching. As you know, the world has become a smaller and more interconnected place. As a result, more and more people around the world are looking to learn English. Even though there are a number of options for learning English in a group or in a classroom setting, the fact is that, for many people, receiving 1-on-1 instruction from a qualified and experienced teacher is their best chance and most preferred option for learning English. 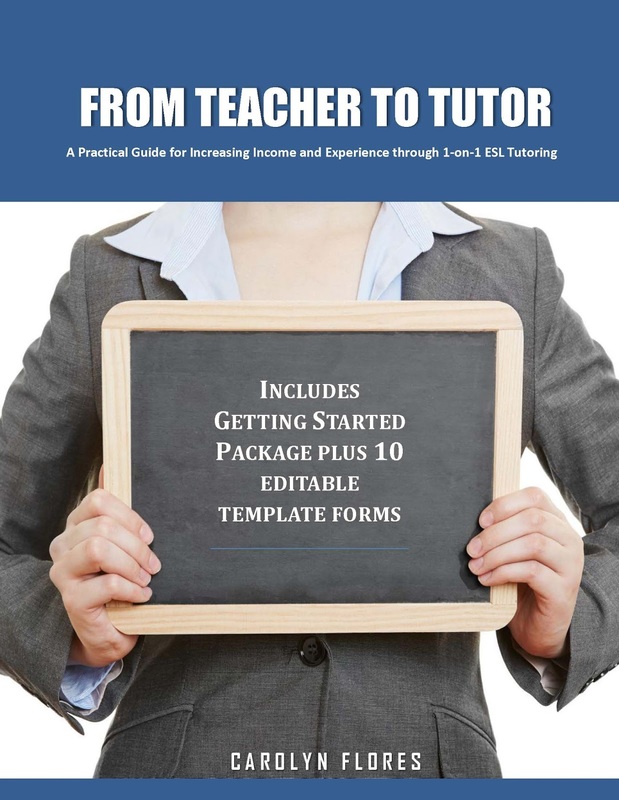 The various forms and templates, like the processes they support, have been developed over my 20+ years as a tutor/tutoring company owner and are what my tutors and I currently use to support our interactions with our clients. I hope you find this package helpful and that your experience is every bit as positive and rewarding as mine has been! If you have any questions or would like to start a discussion, feel free to send a comment below. I look forward to hearing about your new business as an ESL 1-on-1 tutor/coach! Great information in your blog......... Thank you for bringing more information to this topic for me. Im truly grateful and really impressed. You're welcome! Glad you find this useful. Carolyn, I just tried to download some forms, to register new clients for tutoring, and I keep getting a warning regarding the link being unsecured. I'm hesitant to proceed for fear of having my payment information hacked. Please advise, with thanks.